The Archery and Art of Buddha Camping. How Do You Ground Yourself? 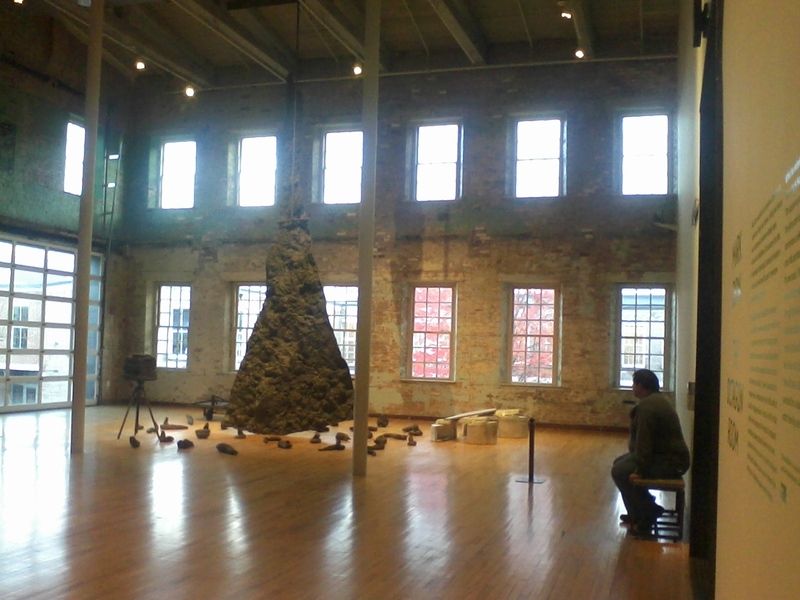 Mass MoCA: It's A Factory! It's Modern Art! It's A Museum! I am going to make this quick because it's 10pm Sunday night, we just got in from the road, and Monday morning promises to come early. Here's my meta message: IF YOU CAN POSSIBLY GET TO Mass MoCA in NORTH ADAMS, MASSACHUSETTS YOU ABSOLUTELY OWE IT TO YOURSELF TO GO. That is all. Well, it's almost all. Here's a little back story: This modern art museum inhabits a 13-acre 19th century factory complex in a mill town in the Berkshires. Friends have been telling me about it for years, and they always use the words "insane," and "amazing". I've been meaning to go for years, but every time I was within a few miles of the place I was inevitably on a trip somewhere else. Mass MoCA is on the weekend to-do list stuck to the refrigerator at home (along with Emily Dickinson's house in Amherst and a dozen other things) but I wouldn't have made it today unless a conference I was attending this weekend hadn't happened in the next town over. "We finally made it to Mass MoCA," I texted my stepdaughter Alix." That is so cool," she texted back. And then, "Dad's interested in art????" "You'd be surprised," I said. "The man's very flexible." "What kind of art does he like?" she asked, still not convinced. "What kind of art do they have there?" "This place is kind of about experiencing art rather than looking," I told her. "Plus the old factory is fascinating on its own." We were in the cafe at the moment, waiting for our lunch to arrive, so I had time to expand my thoughts a little. "He likes physical art -- things you walk through, under, over, etc. Kinetic art that moves. Industrial art. Large, room-sized installations." After lunch we returned to the galleries. Studmuffin took photos with my camera until the batteries died. I took photos with my phone and texted them to the very patient Alix until I swamped her cell. I can't do the place justice in a thousand words, and I don't have the thousand photos. I can give you the website, however: http://www.massmoca.org/. Take yourself there...and drop me a note when you do! I'd love to hear what your favorite installation is! "Kyle Abraham and Abraham.In.Motion Come to Mass MoCA"
Particle Physics in Western Mass.